Sadly summer seems to have ended a few weeks ago, the days are getting shorter and the weather is getting chillier. It all sounds slightly depressing, but that doesn’t mean that our mood has to go lower! Autumn has its own wonderful beauty, with nature becoming more rich and colourful. This is the time of heart warming soups, stews and roasted vegetables. 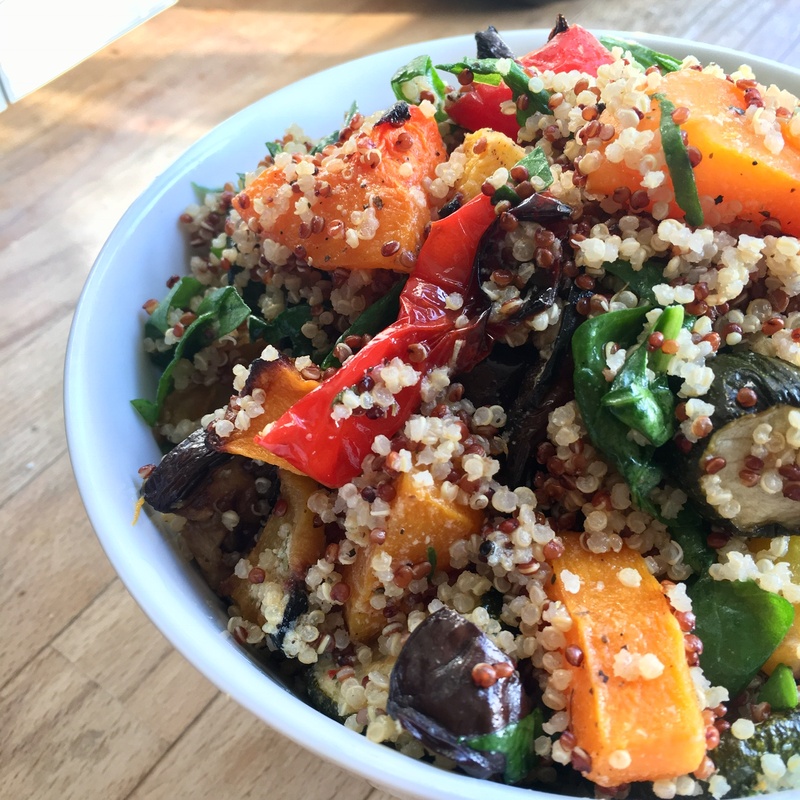 That’s why my new favourite dish is this colourful roasted vegetable quinoa salad, which I can eat hot or cold depending on my mood. 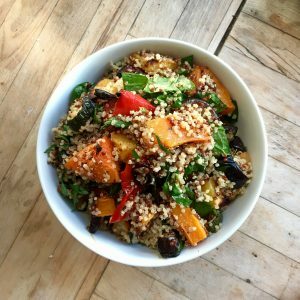 It’s full of exciting vegetables, therefore packed with nutrients, very easy to make, and also vegan. 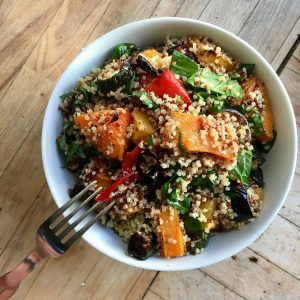 The season’s favourite is definitely butternut squash, not only for its versatility as a food item, but also for its many health benefits, including the ability to protect the skin, promote eye health, reduce chronic disease, improve digestion, lower cholesterol, build strong bones, reduce blood pressure, and so much more! Beetroots are an excellent source of folic acid and a very good source of fibre, manganese and potassium. More recent health claims suggest beetroot can help lower blood pressure, boost exercise performance and prevent dementia. Aubergines are a good source of dietary fibre, calcium, antioxidants and vitamins including vitamin C, vitamin K, vitamin B6, thiamine and niacin. They are virtually fat free and low in calories, sodium and cholesterol and high in folic acid. 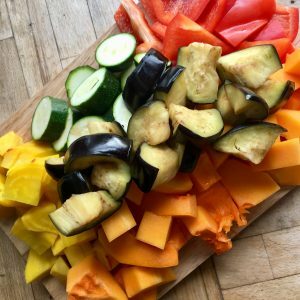 Aubergines also come loaded with a host of minerals essential for the effective functioning of the body, including magnesium, phosphorus, copper, and potassium. For this colourful nutritious salad start by preparing the vegetables. First cut the aubergine, put it in a colander, sprinkle with a generous amount of Himalayan salt and leave it to rest for half an hour. This way you can get rid of the bitter taste and it’s going to be nice and soft instead of spongy after roasting it. Meanwhile peel the beetroot and the butternut squash and discard the seeds of the squash. Dice them, together with the rest of the vegetables (except the spinach) and put them on a baking tray. Season with salt and pepper and roast in a little bit of coconut oil at 180 C until they are soft and golden brown. You might wish to add the sliced courgette towards the end if you don’t want them too soft, as they only need 20 minutes. 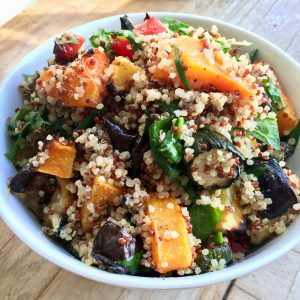 While the vegetables are roasting you can cook the quinoa and make the dressing. Before cooking the quinoa always rinse it well, then cook it covered on low heat in a bit less than double the amount of water. For the dressing put the ingredients in a small container and just shake it all together. Once the quinoa and the veggies are cooked, leave them to cool then mix together with the baby spinach. 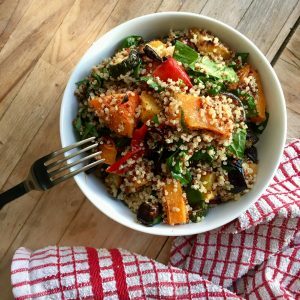 Finally, dress your salad and enjoy!